Home / Ben Bernanke / How big a problem is the zero lower bound on interest rates? If inflation is too low or unemployment too high, the Fed normally responds by pushing down short-term interest rates to boost spending. However, the scope for rate cuts is limited by the fact that interest rates cannot fall (much) below zero, as people always have the option of holding cash, which pays zero interest, rather than negative-yielding assets. When short-term interest rates reach zero, further monetary easing becomes difficult and may require unconventional monetary policy, such as large-scale asset purchases (quantitative easing). Before 2008, most economists viewed this zero lower bound (ZLB) on short-term interest rates as unlikely to be relevant very often and thus not a serious constraint on monetary policy. (Japan had been dealing with the ZLB for several decades but was seen as a special case.) However, in 2008 the Fed responded to the worsening economic crisis by cutting its policy rate nearly to zero, where it remained until late 2015. Although the Fed was able to further ease monetary policy after 2008 through unconventional methods, the ZLB constraint greatly complicated the Fed’s task. If inflation is too low or unemployment too high, the Fed normally responds by pushing down short-term interest rates to boost spending. However, the scope for rate cuts is limited by the fact that interest rates cannot fall (much) below zero, as people always have the option of holding cash, which pays zero interest, rather than negative-yielding assets. When short-term interest rates reach zero, further monetary easing becomes difficult and may require unconventional monetary policy, such as large-scale asset purchases (quantitative easing). Before 2008, most economists viewed this zero lower bound (ZLB) on short-term interest rates as unlikely to be relevant very often and thus not a serious constraint on monetary policy. (Japan had been dealing with the ZLB for several decades but was seen as a special case.) However, in 2008 the Fed responded to the worsening economic crisis by cutting its policy rate nearly to zero, where it remained until late 2015. Although the Fed was able to further ease monetary policy after 2008 through unconventional methods, the ZLB constraint greatly complicated the Fed’s task. How big a problem is the ZLB likely to be in the future? A paper at the recent Brookings Papers on Economic Activity conference, by Federal Reserve Board economists Michael Kiley and John Roberts—of which I was a formal discussant—attempted to answer this question by simulating econometric models of the U.S. economy, including the model that serves as the basis for most Fed forecasting and policy analysis. Kiley and Roberts (KR) concluded that, under some assumptions about the economic environment and the conduct of monetary policy, short-term interest rates could be at or very close to zero (that is, the ZLB could be binding) as much as 30-40 percent of the time—a much higher proportion than found in most earlier studies. If correct, their result reinforces the need for fresh thinking about how to maintain the effectiveness of monetary policy in the future, a point recently emphasized by San Francisco Fed president John Williams and others (and with which, I should emphasize, I very much agree). In this post I discuss the KR result but also point out a puzzle. If in the future the ZLB will often prevent the Fed from providing sufficient stimulus, then, on average, inflation should be expected to fall short of the Fed’s 2 percent target—a point shown clearly by KR’s simulations. The puzzle is that neither market participants nor professional forecasters appear to expect such an inflation shortfall. Why not? There are various possibilities, but it could be that markets and forecasters simply have confidence that the Fed will develop policy approaches to overcome the ZLB problem. It will be up to the Fed to prove worthy of that confidence. As I’ve noted, KR’s research suggests that periods during which the short-term interest rate is at or close to zero may be frequent in the future. They also find that these episodes would typically last several years on average and (because monetary policy is hobbled during such periods) result in poor economic performance. Two key assumptions underlie these conclusions. First is the presumption that the current, historically low level of interest rates will persist, even when the economy is once again operating at normal levels and monetary policy has returned to a more-neutral setting. As another paper at the Brookings conference examined in some detail, real (inflation-adjusted) interest rates have been declining for decades, for reasons including slower economic growth; an excess of global savings relative to attractive investment opportunities; an increased demand for safe, liquid assets; and other factors largely out of the control of monetary policy. If the normal real interest rate is currently about 1 percent—a reasonable guess—and if inflation is expected on average to be close to the Fed’s target of 2 percent, then the nominal interest rate will be around 3 percent when the economy is at full employment with price stability. Naturally, if interest rates are typically about 3 percent, then the Fed has much less room to cut than when rates are 6 percent or more, as they were during much of the 1990s, for example. Indeed, the KR simulations show that the expected frequency of ZLB episodes rises quite sharply when normal interest rates fall from 5 or 6 percent to 3 percent. The second factor determining the frequency and severity of ZLB episodes in the KR simulations is the Fed’s choice of monetary policies. This important point is worth repeating: The frequency and severity of ZLB episodes is not given, but depends on how the Fed manages monetary policy. In particular, KR’s baseline results assume that the Fed follows one of two simple policy rules: one estimated from the Fed’s past behavior, and the second determined by a standard Taylor rule, which relates the Fed’s short-term interest rate target to the deviation of inflation from the Fed’s 2 percent target and on how far the economy is from full employment. Using the Fed’s principal forecasting model, KR find that in the future the U.S. economy will be at the ZLB 32 percent of the time under the estimated monetary policy rule, and 38 percent of the time under the Taylor-rule policy. Because of the frequent encounters with the ZLB, the simulated economic outcomes are not very good: Under either policy rule, on average inflation is about 1.2 percent (well below the Fed’s 2 percent target) and output is more than 1 percent below its potential. What do markets and professional forecasters think? Are these results plausible? A specific prediction of the KR analysis, that in the future frequent contact with the ZLB will keep inflation well below the Fed’s 2 percent target, can be compared to the expectations of market participants and of professional forecasters. Figure 1 suggests that market participants expect inflation to average about 2-1/4 percent over long horizons, up to thirty years. 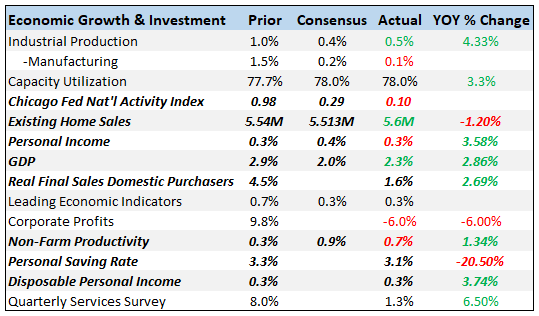 These expectations relate to inflation as measured by the consumer price index, which tends to be a bit higher than inflation measured by the index for personal consumption expenditures, the inflation rate targeted by the Fed. So Figure 1 seems quite consistent with a market expectation of 2 percent for the Fed’s targeted inflation rate over very long horizons. Professional forecasters also see long-run inflation close to the Fed’s target. For example, the Survey of Professional Forecasters projects that the inflation rate targeted by the Fed will average 2.00 percent over the period 2016-2025, precisely equal to target. Similarly, primary dealers surveyed by the Federal Reserve Bank of New York see the inflation rate targeted by the Fed equaling 2.00 percent in the “longer run.” The same group also sees CPI inflation close to 2-1/4 percent over the next five years and during the five years after that, consistent with the inflation swaps data (Figure 1) and with the Fed’s preferred inflation measure remaining close to 2 percent. Interestingly, these respondents do not see the ZLB as irrelevant to policy; at the median, they see a 20 percent chance that the United States will be back at the ZLB by 2019. Why have inflation expectations held up? That longer-term inflation expectations appear relatively well-anchored at 2 percent appears inconsistent with the prediction that interest rates will be at the ZLB as much as 30 to 40 percent of the time in the future, preventing the Fed from reaching its inflation target during those times. How to resolve this contradiction? I don’t think there’s anything wrong with how KR conducted their analyses. Remember, though, their conclusion assumes that the Fed will continue to manage monetary policy using pre-crisis approaches, essentially ignoring the challenges of the zero lower bound. That’s unrealistic. Indeed, following the crisis the Fed addressed the ZLB constraint with a number of alternative strategies, including large-scale asset purchases (quantitative easing) and forward guidance to markets about the future path of interest rates. These policy innovations did not fully overcome the ZLB problem. Nevertheless, they may help explain why the unemployment rate and other measures of cyclical slack fell about as quickly in the recent recovery as in earlier postwar recoveries—a finding of another paper at the Brookings conference, by Fernald, Hall, Stock, and Watson—and also why core PCE inflation fell by less than expected given the severity of the recession. Looking forward, it appears that market participants and professional forecasters believe that the Fed, perhaps in conjunction with fiscal policymakers, will “do what it takes” to mitigate the adverse effects of future encounters with the ZLB. That confidence is encouraging, but it should not be taken as license for policymakers to rest on their laurels. To the contrary, Fed and fiscal policymakers should think carefully about how best to adapt their frameworks and policy tools to reduce the frequency and severity of future ZLB episodes. In tomorrow’s post I’ll discuss some possible approaches. A logical possibility is that market participants and forecasters expect the Fed to shoot for inflation above 2 percent during periods when the ZLB is not binding, in order to achieve an overall average of 2 percent inflation. KR analyze this possibility in simulations. However, although Fed policymakers may be willing to allow inflation to exceed the 2 percent target modestly and temporarily, consistent with the symmetry of the inflation target, they have given no indication that they will tolerate a sustained overshoot. Since holding cash involves costs of its own, interest rates can in fact go slightly negative, as we’ve seen in Japan and Europe. For this reason, the literature generally refers to the effective lower bound on interest rates (which in practice appears to be somewhere between minus one-half and minus one percent) rather than the traditional term zero lower bound. Since this post focuses on the Fed, which has not employed negative interest rates, I’ll refer here to the zero lower bound. The inflation breakevens for ten-year, thirty-year, and five-year five-year-forward horizons are currently all about 2 percent. From 2009 through 2014, these breakevens remained above 2 percent, at levels comparable to the period before the crisis. Breakevens fell below 2 percent in 2015-2016, but most commentary attributes that drop to declines in inflation risk premiums rather than lower inflation expectations; see here for a discussion. Next The zero lower bound on interest rates: How should the Fed respond?